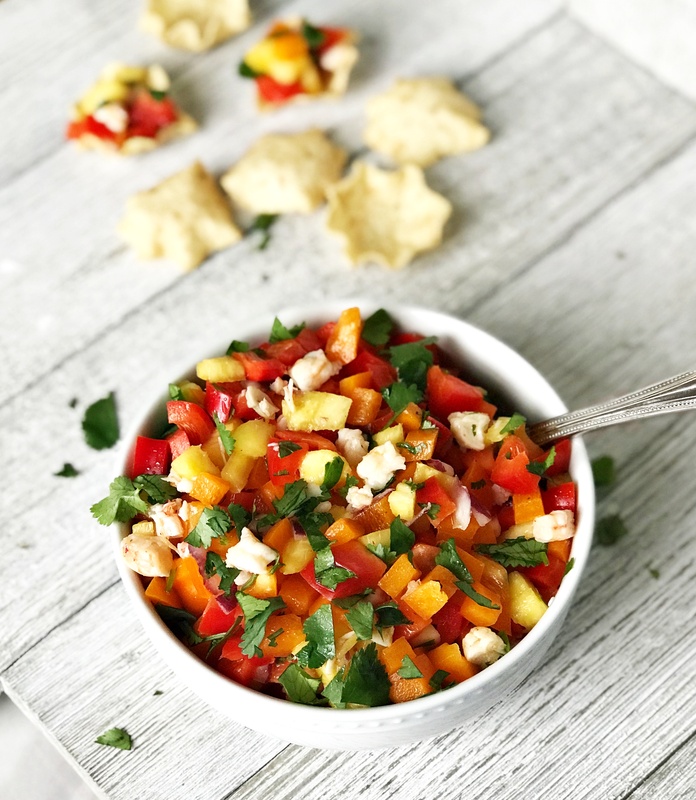 The weather in Ohio gets a little bit warmer (and when I say warmer, I actually just mean the sun came out), and my mind immediately goes to…SALSA. Fresh raw veggies, light flavor, and a healthy, munchy snack! Which makes me proud to announce…its time for us to say bye to seasonal depression, and hello to good-vibe salsa season! 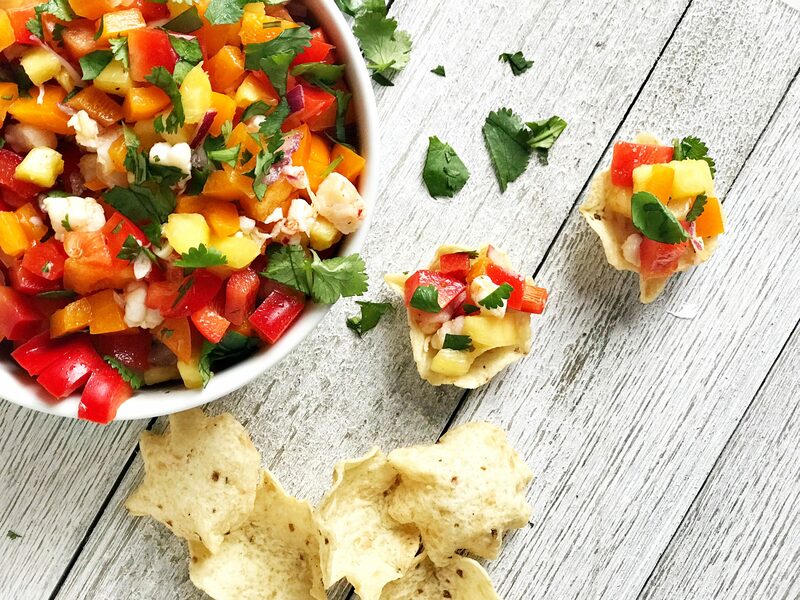 Alas, my inspiration for this PINEAPPLE SHRIMP SALSA! 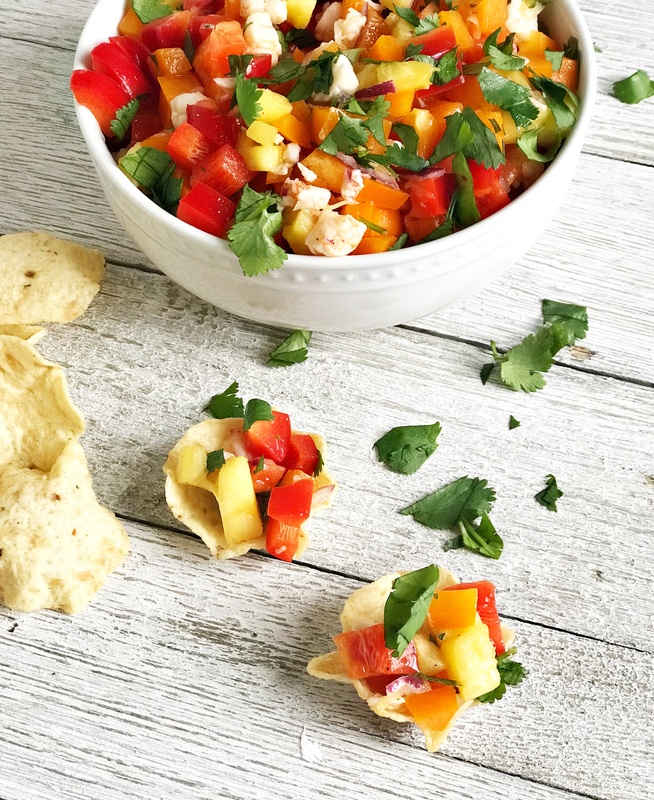 This recipe turned out so-so delicious…and also super colorful (which I’m always a huge fan of)! What I love about this salsa though, is that you can eat it with chips, OR use as a topping on baked chicken, or fish! The most time-efficient way to make this recipe is to cook your shrimp first, so you can chop veggies during the cook time. Cook the shrimp on stovetop over medium heat, with oil, and garlic. Once the shrimp is finished cooking, remove from heat, mix in lemon juice, and let cool. 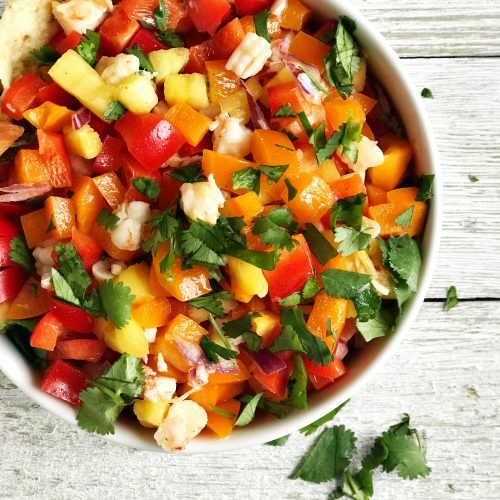 Take all of your chopped ingredients (peppers, onion, cilantro, pineapple, shrimp) and add to a large mixing bowl. Whisk together oil, red wine vinegar, lemon juice, salt and pepper, and then mix into salsa before serving. Now let’s talk about the elephant in the room…how the heck do I cut up a whole pineapple? Using a large, serrated knife, chop the top off the pineapple. Stand it up straight (exposed flesh facing up) and begin to cut the skin off. Start your knife at the top end, where there is open flesh. Cut a thin layer all the way down, to remove the tough exterior skin. Repeat this until all exterior skin is removed. Similar to an apple, pineapples have a tough core. You’ll want quarter the pineapple (from top to bottom), by slicing off a large chunk on all four sides around the core. Sometimes you can see where the core is, or you’ll know because it will be harder to run your knife down the length of the pineapple. Ripe pineapple flesh is very easy to cut through. Take your four large chunks of pineapple meat (they will be different sizes) and cut into smaller chunks for serving. Or for the purpose of this recipe, cut small pieces that are similar sized to your chopped peppers. How can I tell if a pineapple is ripe? There are two indicators of a ripe pineapple. First, look out for yellow skin. A yellowish colored skin indicates ripeness, vs green indicates it isn’t ready yet (similar to bananas). Second, it smells sweet. Seriously! If you smell your pineapple skin and it smells sweet, it means its ready to eat! How cool is that?! I know cutting up a whole pineapple can be intimidating, but it is hands down worth it! It’s so juicy and flavorful, you’ll likely never go back to pre-cut pineapple. 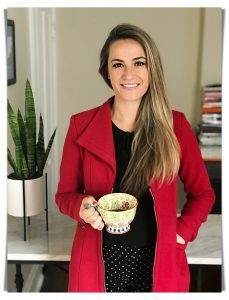 I like to store mine in the fridge and eat throughout the week, or add to salsas or smoothies! 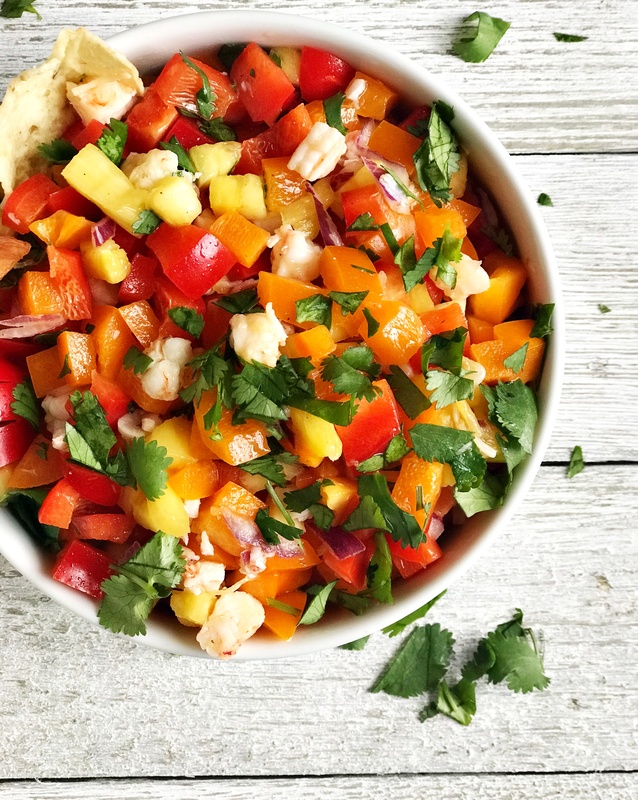 Healthy and flavorful salsa made with ripe pineapple, lemon garlic shrimp, and bright, chopped veggies! Garnish with cilantro and serve with chips, or use as topping to your favorite fish or chicken! In a small to medium saucepan, add 1 tbsp oil and minced garlic to medium heat. Sauté for 2-3 min, then add shrimp. Cook shrimp until pink all the way through, approx 7-9 min. Remove from heat, add lemon juice and mix around. While shrimp cools, chop bell peppers, pineapple, onion, and cilantro. Add all ingredients to a large mixing bowl. Prepare dressing by adding all dressing ingredients into a small mixing bowl, and whisking together until combined. When shrimp have cooled, chop into small pieces and add to large mixing bowl with veggies. Drizzle on dressing, mix together, and serve. Store in the refrigerator for up to 3 days.